Look around you in any public area, and you will see people across all demographics with their heads down, browsing the web on their smartphones. We all know that mobile device use is on the rise. Because of this current and continuing trend, Mobile-Friendly design is now more important than ever. It now only ensures a great user experience regardless of the device used to browse, but also helps search engines look favorably on your site when determining rankings. What is Mobile Friendly Design? Compared to desktop websites, mobile versions serve a unique task. Though limited in space and functionality, they still need to provide information to prospective clients in a clear and effective way. But because of these limitations, your website may not look or function on mobile devices the way it does on desktop. 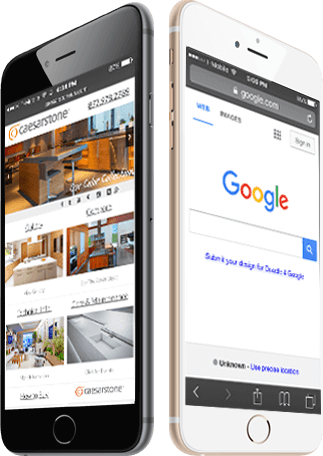 Mobile friendly design ensures that your visitors will have the best experience possible on your website whether they are browsing on their desktop, smartphone, or tablet. . If a user can’t easily navigate and read the content on your website through their mobile device, they will likely leave a bit frustrated and may not return. Having an upgraded mobile interface will cultivate an increased retention of potential customer visits. An attractive mobile website immediately sends a positive message to your visitor, and helps you stand out from your competition. It also demonstrates that you have a modern grasp of your brand identity for your organization, which is an expectation most consumers have of the brands they purchase from. Google is well aware of the growing necessity of mobile-friendly websites, and has updated its algorithm to consider mobile friendliness as a ranking factor. If Google sees that your website is not mobile friendly, it will penalize your site’s rankings compared to that of your competitors’, which will weaken both traffic and conversions for your website.